The new ACUVUE OASYS® Brand Contact Lenses 1-Day with HydraLuxe™ Technology has a tear-infused design with an enhanced network of tear-like molecules that integrates with your own tear film each day to help reduce symptoms of tired eyes and dryness. This lens has the perfect combination of performance and comfort. It has the highest UV-A and UV-B protection available in a daily disposable contact lens—blocks at least 96% UV-A and 99% UV-B. ​NEW ACUVUE® VITA™ Brand with HydraMax™ Technology might be for you. Have you begun moving your phone further away to find the “sweet spot” where you can see clearly? ​The new 1-DAY ACUVUE® MOIST Brand MULTIFOCAL allows you to see clear at all ranges- near, far, intermediate, in dim light, and bright light. 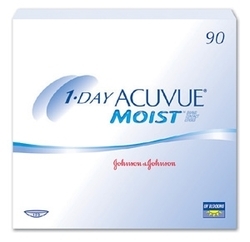 And because they’re built on the 1-DAY ACUVUE® MOIST platform, you’ll get the same comfort and convenience you expect. Bausch + Lomb Ultra for Presbyopia are monthly wear contact lenses that offer exceptional comfort and outstanding vision in a multifocal lens. MoistureSeal technology provides all day comfort and 3-Zone Progressive Design provides clear vision up close, far away, and in between. Also transitions between distances is seamless.